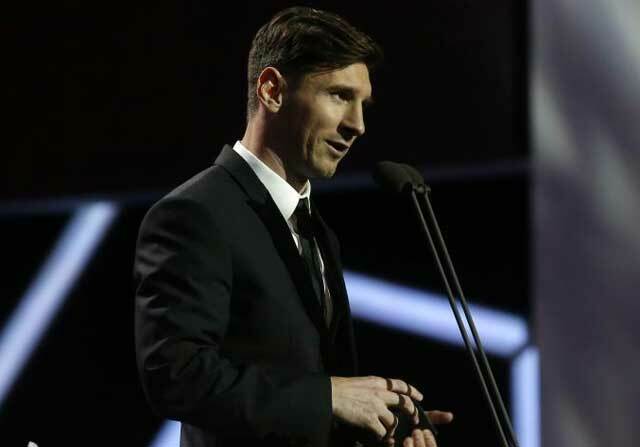 Leo Messi was the leading figure at the LFP Awards Gala last night. The Argentinean took two prizes: Best Liga BBVA Player of last season, and Best Forward, which meant the overall balance of awards was tipped in Barcelona‘s favour. Azulgrana players, between them, carried off a total of five awards, to the three picked up by Real Madrid players. Sergio Ramos (Real Madrid) was the first player to pick up an award at the gale. The Blanco centre-back won the Best Defender award, ahead of Otamendi (Valencia, now at Manchester City) and Piqué (Barcelona). Ramos thanked the LFP, “the best league in the world”, as well as his team-mates and his family. Messi (Barcelona) came out on top, above Cristiano Ronaldo (Real Madrid) and his own team-mate Luis Suárez (Barcelona) as Best Forward in the Liga BBVA. The Argentinean carried off the award despite the fact that Ronaldo, with five more league goals, a tally of 48, won the ‘Pichichi’ prize in the last campaign. Xavi Hernández, taking part from Qatar, read out the names of the candidates for the Best Midfielder award and his former team-mate, and friend, Carles Puyol read out the name of the winner. James Rodríguez (Real Madrid) took that prize, ahead of Iniesta (Barcelona) and Griezmann (Atlético de Madrid). Claudio Bravo (Barcelona) was chosen as the Best Goalkeeper in the league, a prize that was handed to him by his own team-mate Neymar. Diego Alves (Valencia) and Asenjo (Villarreal) were the other finalists. Luis Enrique (Barcelona) won the prize for Coach of the Year, thanks to having steered his team to three titles. Jordi Mestre, the Blaugrana vice-president, picked up the trophy on his behalf. Fran Escribá (Elche, now at Getafe) and Unai Emery (Sevilla) were the other two candidates. The winner of the Fans’ Award was Cristiano Ronaldo. The Portuguese was unable to attend the gala so Sergio Ramos picked up the trophy for him. This prize is awarded based on fans’ votes. Feghouli (Valencia) took the prize for Best African Player in La Liga. The Algerian prevailed over Amrabat (Málaga) and El Arabi (Granada) and his team-mate Dani Parejo picked up the trophy for him. Neymar (Barcelona) was chosen as the Best American Player, ahead of Luis Suárez and James Rodríguez. Bernardo (Sporting de Gijón) beat Cifuentes (Girona, now Elche) and Marc Valiente (Valladolid, now Maccabi Haifa) to the Best Defender in the Liga Adelante award. Óscar González (Valladolid) took the prize for Best Midfielder in the second tier, beating youngsters such as Marco Asensio (Mallorca, now on loan to Espanyol from Real Madrid) and Adama Traoré (Barcelona B, now at Aston Villa). ‘Pichu’ Cuéllar (Sporting de Gijón) wone the award for Best Goalkeeper in the Liga Adelante, beating Isaac Becerra (Girona) and Antonio Adán (Betis). Rubén Castro (Betis) beat Jorge Molina (Betis) and Borja Bastón (Zaragoza, now Eibar) to the title of Best Forward in the division. Pablo Machín (Girona) admitted that he was surprised to have been awarded the prize for Best Liga Adelante Coach to the detriment of Abelardo (Sporting de Gijón) and Paco Herrera (Las Palmas).